I can not create a Rescue CD! When I choose "CD" and attempt to download after a short while I get a prompt that states "Failed to create rescue disk." The problem is I can not download the ISO required to burn the rescue disk. 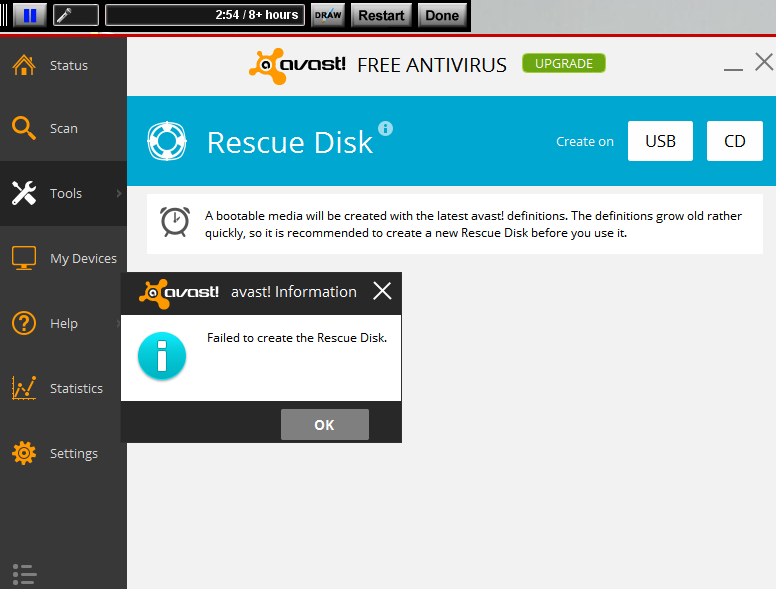 Is there another place where I can download the ISO since I can not download the toolkit using Avast? You are not alone, there is obviously something wrong with the server/system. Looking at the Rescue Disc sub forum there are others having problems. I am on a 24Mb connection and the "Toolkit" was downloading for for 2 hours then died. Mine isn't a download problem but a creation problem. I was trying to burn the CD but didnt work.Despite Im an advanced PC user with 14 years experience at 8h/day. I cant find the Rescue Disk in Google. Only trhu Softonic who asks your mobile normally. I know some of my facts are missing. Its clear: Avast should investigate this point. Just tested it and it works without any problem at all for me. Download, burned and tested the cd. Downloaded, safed and tested the usb. That makes you the exception to the rule Eddy. why I keep getting that same error message each time I try to create a recovery USB. into the folder ¿Which folder? ¿Thats all to have a rescue DVD? Avast AV is simple. The rest is messy. SW developper dont realize how complicated it is. "The drunk thinks everybody is drinking" (its my quote). SW develppers: the easiest, the most valuable. ¿You get it? The easiest is better than the best. You need to create ISO file and save it into the folder as described in the article. If you'll get an error message you need move to C:\ProgramData\AVAST Software\Avast\log\ directory and attach EventLog.log file at the forum. DearAndtey, yo didnt answer my question. Pls try not to refer to previous answers since its complicated to mix them not been knowledgeable. Pls try not to be criptic or so concise. What would you Google to find the damm Rescue record.My avast Premer has finished its month trial.And I m very overwhelmed.Tks. Sorry but your answer isn't acceptable. This is something that needs input from Avast. in order to complete a simple task of creating a recovery media. If it doesn't work and can't be fixed, then it should be removed. I even created a video about this excellent and needed function.